Sensational, and we choose to believe that he meant every inch of that glorious parabola! 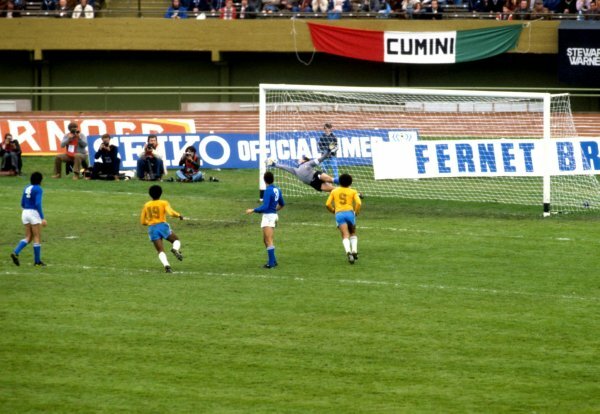 While hosts Argentina won the tournament outright, Brazil went on to beat Italy 2-1 in the play-off to claim the bronze. One of my all-time favourite World Cup goals. Nelinho also scored a cracker against Poland in the same tournament. FYI, the thumbnail image to this post is a picture of Dirceu in the ’82 World Cup. @James: Good spot. Dodgy PA photo captioning to blame there. I’ll change it post haste. Clearly not a fluke. He kicks with the outside side of his foot, intending for the ball to swerve to the inside of the goal. If he meant to cross, he would kick it with the inside of his foot. Furthermore, Nelinho is famous in Brazil for a career filled with extraordinary kicks and freekicks. If there is one guy who could make such kicks on PURPOSE, it was him.